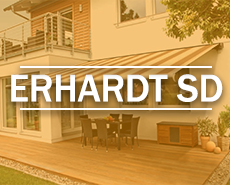 New to Samson Awnings for 2018, we have chosen to partner with Erhardt Markisen, a leading manufacturer of high quality awnings and glass roof terrace cover systems. 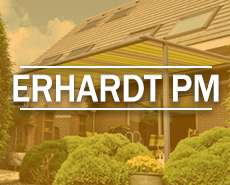 Founded back in 1980, Erhardt Markisen have grown massively over a short period of time. Starting as just a one man operation, the company now operates out of a headquarters at a site in Burtenbach, in the famous Southern German region of Bavaria. 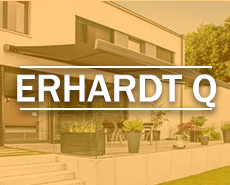 Erhardt Markisen focus on exceptionally high quality products, which are combined with fresh and innovative designs and ideas. 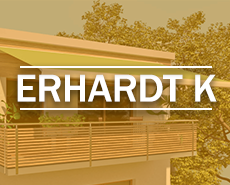 This highly ambitious approach has led to Erhardt becoming one of the most recognised and respected names within the industry, and it is this reason which enables you to purchase an Erhardt product with absolute confidence. Their products are all made from high quality material, from the aluminium framework to the fabrics, which undergo strict testing in both the weaving plant and the sewing room, whilst the current range of materials spans to over 250 different fabric designs across seven different collections. 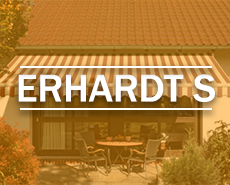 We stock a fantastic range of eight different awnings and two terrace covers. 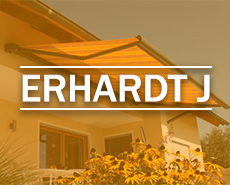 From the light weight Erhardt K, to the ultra-impressive Erhardt SD, there’s an awning to suit every need. 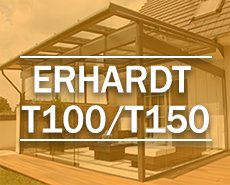 The T100 and T150 glass roof systems, meanwhile, offer unparalleled protection with fantastic design, and the ability to fill in the sides with sliding glass doors and panels. 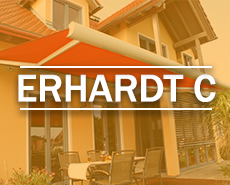 Whilst many awnings are adaptable to at least some degree, many awnings are most suitable to a specific application, and Erhardt awnings are no different. 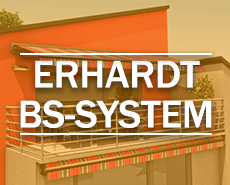 The Erhardt K for instance, is designed to be perfectly at home on balconies or terraces, whilst amongst their more generally suited awnings are the Erhardt BS-System, the Erhardt C, or the Erhardt S. All of their awnings have different advantages, from the flexible installation options of the Erhardt C, the high performance of the Erhardt SD or the stunning Bauhaus design of the Erhardt Q.
Erhardt offer the world beating T100 and T150 models of glass roof system. these are two similar systems that contain a few key differences. With high quality aluminium framework and the ability to fill in the sides of the system with glass, these are flexible and impressive systems that can transform your outside space.